Now I know this site focuses primarily on Argentina but I think it would be great to mix in a few surprises once in a while from the neighbors. This popular condiment, served throughout Chile, is so good that I would never forgive myself for not letting you know of its existence. I can eat pebre like a soup. Pebre is like the distant cousin of chimichurri for it is used for all the same reasons-to accompany grilled meats. 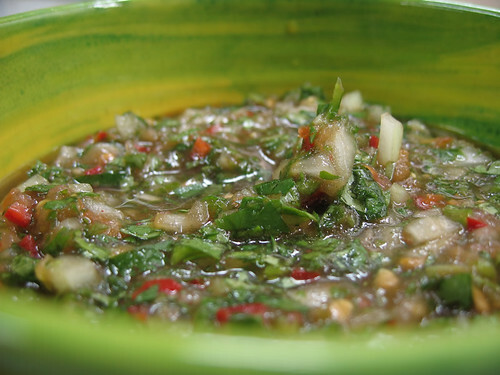 Although chimichurri improves with time, pebre is best enjoyed somewhat fresh. Needs a little time to mesh the flavors, but since cilantro is a primary ingredient, this really needs to be consumed as soon as possible for full enjoyment. Cilantro, a touchy sensitive herb, loses much of its well known pungent flavor quite quickly after use–in case you didn’t know. If you are familiar with pico de gallo then you’ll probably notice that pebre is quite similar yet perhaps a little more saucier. Here’s a recipe that I gleaned from a Chilean friend, yet with few minor quantity modifications. As with chimichurri, everyone has their own special recipe where some ingredients are swapped for others or proportions may vary. Scallions or green onions instead of yellow onions. Wine instead of vinegar, and so on. Mix all of the ingredients into a bowl. Allow to sit for at least an hour. Use within a day for maximum flavor. *Cilantro is a wonderful herb yet many are turned off by it. Has a soap-perfume smell or taste they say. If they don’t like it, too bad, more of this tasty sauce for those who do. Mess around with the quantities to your liking. **Sold throughout Chile and Argentina, Knorr’s Aji Picante is the chili paste of choice for some versions of pebre. If you can’t find Knorr’s, just substitute with Sriracha (or any thick spicy red chili sauce) although it may add a stronger taste.